C.S.Lewis was a very smart man. We are NEVER too old to set another goal or to dream a new dream. 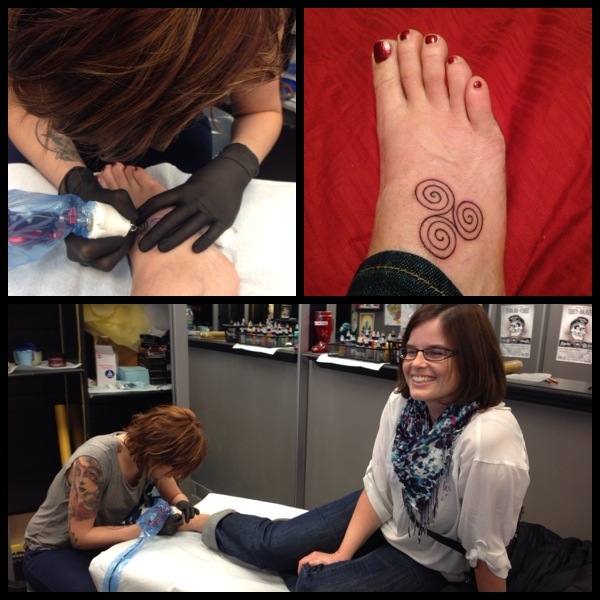 And apparently, we are never too old for a tattoo. Yep, I’m 41 years old and I just got a tattoo. My original plan was to get one when I turned 40. Yet, 40 came and went and I still didn’t get one. I think I was just too nervous, so I kept putting it off. Then a few months ago, I saw a Wag Jag deal (an online coupon website) for the local tattoo place in town. Being very frugal and not wanting to spend so much money on myself I bought the Wag Jag with 64% discount. Awesome deal, eh?!?! Then, last Friday, my husband picked me up from work, and off we went. I got it done! The Celtic Triskele, or triple spiral, dates back to pre-Christian times. It represents the drawing of the three powers of maiden, mother and crone. It is a sign of female power, especially power acquired through transition and growth. As Christianity came into the forefront of Ireland, the triple spiral took on the new meaning of the Trinity (Father, Son, Holy Spirit) and the symbol of eternity. When I became a mom, I was drawn to the spiral. I think it represented the new beginning motherhood offered. Eventually I had three children, hence the three spirals. When I accepted Christ as my Saviour, my life was reborn. I had a new beginning and my life was transformed . The three spirals are for God, Jesus and the Holy Spirit. So, there you have it. Either I’m mildly insane or going through an early mid-life crisis. ha!ha! But whatever it is, I love my tattoo! Do you have a tattoo? If so, is there a meaning behind it? But I love it. Thanks for being a great example of a life fully lived. yeah i’m 37 and i dont feel that – the number sometimes make me go “whaaaat! ?” and then i look at how big my kids are getting and think, yip i better have a decent age on me! we do young adults ministry so that keeps our hearts young i reckon… oooh how exciting re the mission trip, def a good excuse for come cute flip flops (we call them jandals here in New Zealand) – and wow re the snow! Enjoy your New Zealand sun!